Area swept out per unit time by an object in an elliptical orbit, and by an imaginary object in a circular orbit (with the same orbital period). Both sweep out equal areas in equal times, but the angular rate of sweep varies for the elliptical orbit and is constant for the circular orbit. Shown are mean anomaly and true anomaly for two units of time. In celestial mechanics, the mean anomaly is the fraction of an elliptical orbit's period that has elapsed since the orbiting body passed periapsis, expressed as an angle which can be used in calculating the position of that body in the classical two-body problem. It is the angular distance from the pericenter which a fictitious body would have if it moved in a circular orbit, with constant speed, in the same orbital period as the actual body in its elliptical orbit. which is called the mean angular motion of the body, with dimensions of radians per unit time or degrees per unit time. Mean anomaly does not measure an angle between any physical objects. It is simply a convenient uniform measure of how far around its orbit a body has progressed since pericenter. 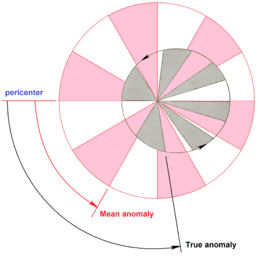 The mean anomaly is one of three angular parameters (known historically as "anomalies") that define a position along an orbit, the other two being the eccentric anomaly and the true anomaly. where M0 is the mean anomaly at epoch and t0 is the epoch, a reference time to which the orbital elements are referred, which may or may not coincide with τ, the time of pericenter passage. The classical method of finding the position of an object in an elliptical orbit from a set of orbital elements is to calculate the mean anomaly by this equation, and then to solve Kepler's equation for the eccentric anomaly. and here mean anomaly represents uniform angular motion on a circle of radius a. ^ Montenbruck, Oliver (1989). Practical Ephemeris Calculations. Springer-Verlag. p. 44. ISBN 0-387-50704-3. ^ Meeus, Jean (1991). Astronomical Algorithms. Willmann-Bell, Inc., Richmond, VA. p. 182. ISBN 0-943396-35-2. ^ Smart, W. M. (1977). Textbook on Spherical Astronomy (sixth ed.). Cambridge University Press, Cambridge. p. 113. ISBN 0-521-29180-1. ^ Vallado, David A. (2001). Fundamentals of Astrodynamics and Applications (second ed.). El Segundo, CA: Microcosm Press. pp. 53–54. ISBN 1-881883-12-4. ^ Smart, W. M. (1953). Celestial Mechanics. Longmans, Green and Co., London. p. 38. ^ Roy, A.E. (1988). Orbital Motion (1 ed.). Bristol, UK; Philadelphia, PA: A. Hilger. ISBN 0852743602.